Location: On the corner Creek & Ann St. Entry is free, donation appreciated. It is open Monday – Friday 11 am to 2 pm. The entrance is on the side on Ann St. This was a lovely visit. The Church was really quiet and the guides were extremely helpful and friendly. A different atmosphere to the Cathedral but still really nice. The thing that struck me the most was that it was very much like a boat, with the dark wooden rafters and ceiling. There is also an interesting war memorial on site. For the 100th anniversary members of the church made a big quilt. Everyone made a ten centimeter square about what the church means to them. We both want/need queen size quilts for our homes. So quilts it is! And another longer term project! The memorial stands right in front of the central station. Access to the shrine is open Monday – Friday from 9 am to 3 pm. The shrine is UNDER the memorial. walk around it and down the steps to the little park . Turn left and go into the tunnel under the stairs that leads to the station. The tunnel with memorial signs is on the left. It was interesting to visit a non European war memorial and notice the similarities and differences, in particular the references to Vietnam, Japan and Pacific Islands which aren’t (we don’t think) as common in Europe. It was a sombre but enjoyable and interesting visit. None here, respectfully leaving the poppies for remembrance. It’s free, donation appreciated. You have to join a tour to get in. Tours are held Monday to Friday at 2pm. When you are in front of the main entrances go left into the reception area where you wait for the guide. He did not offer any mysterious handshakes, code words or any turned up trouser leg action but our guide Deputy Grand Secretary Graham was informative and interesting as we nosied around the centre. He explained the pomp and ceremony, procedures, secret symbols and history of the Freemasons in Brisbane including the charity work they regularly do to support local and international causes. We got to look around one of the main halls, the memorial area and even managed to get a peek inside the library where we met a future Grand Master (once again no handshakes). Practical Info: It’s free, 5 dollar donation suggested. Open Monday – Saturday 9.30am – 4.30pm, Sunday 11am – 4.30pm. You can’t miss it: big fat building on Ann street. There is currently a lot of building work going on around the street but the cathedral is still open for business. After making sure we weren’t gate crashing a funeral, the first thing that struck us on entering the cathedral was that it was so light, airy and new. Once again we were extremely lucky to meet an enthusiastic and knowledgable volunteer who was able to show us about and point out lots of interesting elements that we may have missed, so a big thank you to Rod! It was great to see how the cathedral has evolved and adapted to the community around it in the course of it’s 100+ years. The different styles and fashions of the decades are reflected in everything from the pew cushions to the architecure, and the stained glass windows are used to with great effect to reflect the cultures of the local area and communities. In the chapel area there is an amazing set of chair cushions depicting a modern (and very Australian!) interpreatation of the Nativity. Rod informed us that this is the only portrayal of naked Virgin Mary you will find in a cathedral. 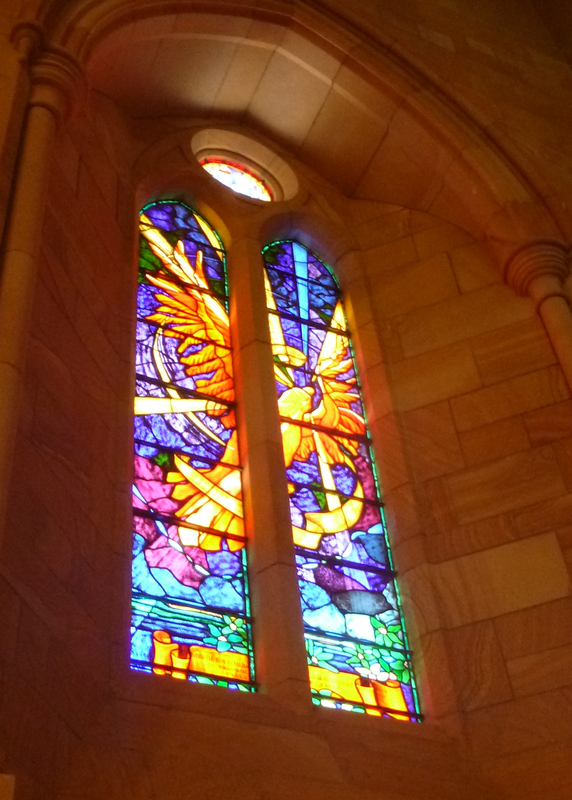 Stained Glass Window commemorating the Australian and American efforts and friendship during WWII.